We are pleased to inform you that Suzuki will have a major presence at the 40th Tokyo Motor Show, which will be held from 24 October to 11 November 2007* at the Makuhari Messe (Nippon Convention Center) in Chiba Prefecture. The Suzuki automobile booth will have a "Small Cars for a Big Future" theme reflecting the huge future possibilities that we envisage for compact cars. Each of our exhibits will embody the unique spirit and technological prowess that have made Suzuki the leading name in compact-car design and production. Our automobile press briefing is scheduled to take place at 14:30 JST (GMT+9:00) on 24 October. A brief preview of some of the vehicles we will be presenting is given in this release. After wowing the car world with the Concept Kizashi at the 2007 Frankfurt Motor Show, Suzuki will be unveiling the Concept Kizashi 2, a crossover sports wagon whose design conveys the dynamism of a top athlete and inspires a powerful sense of excitement. Conceived for energetic people in activities ranging from business to leisure, the Concept Kizashi 2 has an emotionally appealing shape that reflects a dual focus on status and vitality in a way that generates excitement about its performance and heightens the pleasure of ownership. Under the bonnet, a 3.6L V6 engine-the highest-displacement engine ever used by Suzuki-is mated to a six-speed automatic transmission for powerful-feeling acceleration and class-eclipsing performance during high-speed cruising. For superior environmental performance, Suzuki is pursuing solutions such as hybrid technologies. 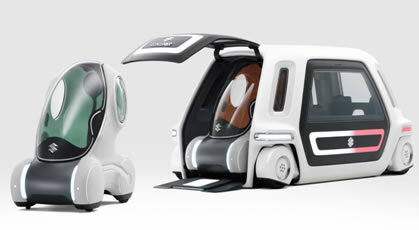 Suzuki has a new people-centred vehicle concept called Sustainable Mobility, which is realized by a one-person low-speed transport device called the PIXY and a minicar-based mobility unit called the SSC, which forms an automobile when the PIXY is paired with it. The PIXY and SSC together deliver personal, shareable urban transportation in line with the Japanese Ministry of Economy, Trade and Industry's Next-Generation Vehicle and Fuel Initiative, which is aimed at realizing the world's most people-centred motorized society. The PIXY is a one-person transport device based on a concept of "friendly" mobility. Moving at low speeds on footpaths and inside buildings, it's enjoyably easy to operate even for people who can't drive conventional cars. It can be paired with the SSC for even greater possibilities. The SSC is a minicar-based mobility unit with which the PIXY is mated to form an automobile. It can hold a maximum of two PIXYs. It's not the only type of unit with which the PIXY can be coupled; to accommodate other lifestyle situations, the PIXY can also be paired with a sports-car unit called the SSF and with a boat unit called the SSJ. The result is an entirely new kind of personal mobility and sharing system. 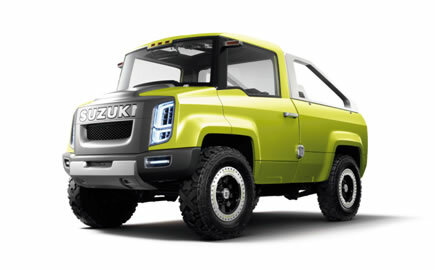 The X-HEAD is a cross-utility vehicle that offers unprecedented possibilities. With DNA reflecting the rough-road performance and toughness of the Jimny and Grand Vitara (Escudo) and the load-carrying capability of the Carry, it's the epitome of functional dependability and fun. Its name signifies diverse new potential for accommodating the lifestyles and priorities of users. A key feature of the X-HEAD is that it can hold various load-bed units for diverse purposes. For instance, it can hold a unit called the Camper, which allows two adults to sleep in comfort, a unit called the Fashion, which provides stylish urban mobility, or a unit called the Rescue, which is designed for rescue operations in a wide range of road conditions. The PALETTE is a minicar that's aimed at parents who cherish time with their children and at youngsters who like having fun with friends. Combining emotionally appealing styling with a cabin that's roomy enough for four people, it delivers a level of comfort that's unprecedented among minivehicles. Plus, it has revolutionary packaging in which left- and right-hand powered sliding doors and a low, flat floor promote convenience for diverse lifestyle situations. 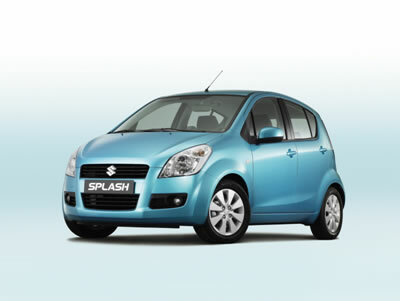 The Splash is a world strategic model to be launched by Suzuki in Europe scheduled for spring 2008 to enhance its sales potential of the compact-car segment. Aimed at families who enjoy active lifestyles, it combines an exciting colour scheme with a fresh design and an enjoyable driving experience. The SX4 WRC is ready for its debut in the Rallye de France, where it will make its first run under real competition conditions. It will later run in the Wales Rally GB-its last test before Suzuki begins its first full World Rally Championship season in January 2008. The MIO is a fuel-cell-powered electric wheelchair that Suzuki unveiled at the 2006 International Home Care and Rehabilitation Exhibition. At the 2007 Tokyo Motor Show, we will be showing a model with heightened fuel-cell performance and a more elegant design. Feel the joy of riding motorcycle! Look at this motorcycle! 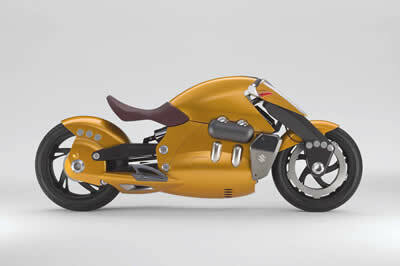 This concept model "The Biplane" communicates the joy of two-wheel mobility through a design that was uniquely inspired by the feeling of flying or piloting an aeroplane, which gives motorcyclists a similarity feeling while riding bikes. Despite being a modern machine, it gives a great feeling of openness-thanks to a shape that has a biplane - no canopy - motif, which was always giving softer, human-friendly and warm feeling to us. It's powered by a V4 engine. The crosscage is a fuel-cell motorcycle in which a simple, compact, lightweight air-cooled fuel-cell system and a high-performance secondary battery are brought together in a way that realizes optimal power control. A fuel-cell unit from British specialist company Intelligent Energy delivers quick activation with low fuel consumption, and a lithium-ion battery combines safety with a low environmental burden. 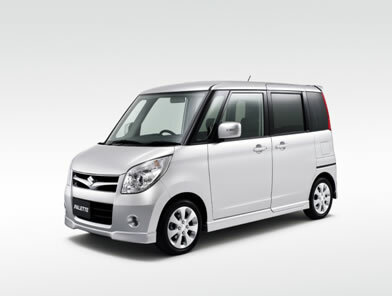 The simplicity, compactness, and lightness of these technologies not only make the crosscage environment-friendly; they also helped enable sporty styling befitting the Suzuki name. 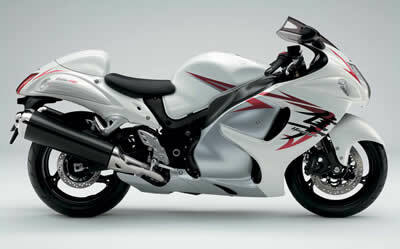 The Hayabusa has been Suzuki's flagship "ultimate" sportbike in worldwide since we launched it in first-generation form in 1999. With the unique package of its distinctive styling and overwhelming engine performance which is described as "the effortless" performance, it's consistently popular. For 2008, a full model change has further evolved its styling for even better aerodynamics while achieving better rider protection. Notably, Suzuki worked in line with a "one piece" concept of treating the rider as an element of the bike's aerodynamic characteristics, taking the rider's position into careful account in pursuit of aerodynamic advances. At the same time, we increased the engine displacement to enhance engine performance. The overall result is a bike that looks and performs like nothing else on two wheels. Note: The new Hayabusa is already available in North America and Europe. The concept becomes reality. 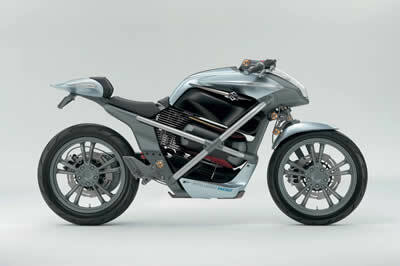 Unveiled in concept form at the 2001 Tokyo Motor Show, the B-King is Suzuki's flagship big naked bike. The production model is completely faithful to the concept seen in 2001 but embodies new functions such as S-DMS, and performance advances that make it even more appealing to riders. 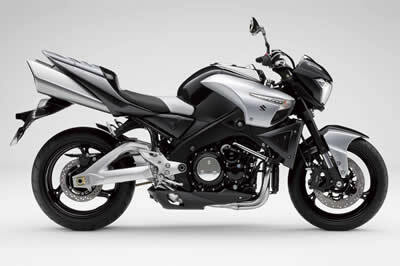 Strikingly distinctive body styling gives the B-King overwhelming visual presence, and Suzuki's latest performance technologies give it a motorcycle with powerful styling to match its strong personality. Built with genuine Suzuki DNA. Note: The B-King is already available in North America and Europe. 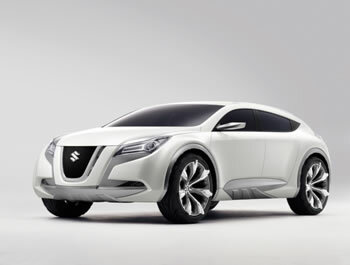 First seen at the 2003 Tokyo Motor Show, Suzuki's three-dimensional-cam engine is a technology proposal for making more effective use of limited natural resources. Its three-dimensional cams continuously adjust the engine's operating characteristics over the entire range of operating conditions from low speeds and low loading to high speeds and high loading, resulting in optimal fuel efficiency and power at all times. Compared with a conventional engine of the same size, it gives 20% better fuel economy and up to 6% higher torque across the rev range. Further, it has no throttle valve and thus runs with significantly lower pumping losses.